A FILTHY drug-ridden Gosport flat taken over by ruthless drug dealers from London has had a closure order slapped on it in a desperate bid to put an end to carnage that has blighted a neighbourhood. Drug addict Robert Crozier was slapped with the order at 6 Trinity Close after Portsmouth Magistrates’ Court heard harrowing stories of how the flat had ruined the lives of nearby residents. But Crozier will not be thrown out on to the streets after the court decided he was the victim of exploitation from dealers, who would peddle him drugs to use his apartment as a base to feed addicts in the community. Innocent neighbours were subjected to a variety of terrifying ordeals including having a lump of concrete thrown through a window and being tormented by out-of-town dealers who would dish out obscenities and prowl the block day and night. A flurry of customers would turn up at all times of the day who would repeatedly press the intercom button. Prosecutor Mary Aspinall-Miles said: ‘Mr Crozier uses illicit drugs which increases his mental health problems. Drugs and paraphernalia were found at the site and it is clear that Mr Crozier was involved in dealing. ‘There was transient dealing take place, known as “county lines” where dealers from London use the flat as a base to deal drugs from. Mr Crozier fits the mould of someone who is used by the dealers from London. ‘There was multiple visitors day and night turning up at the flat which led to residents feeling anxious and afraid to leave their flats. They have been living in fear and are not able to enjoy where they live in peace and quiet. Crozier – who was accused of ‘not engaging’ with authorities – highlighted the utter depravity of the predicament he found himself in as he pleaded not to be thrown out of the place he had lived in for 16 years. 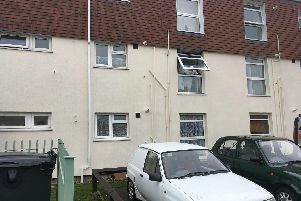 No 6 Trinity close Gosport Closure Order''Property closed due to unlawful use of drugs on the premises. He said: ‘I’ve never had trouble at the flat before. Police never came round when I needed it. These people have been bullying me. I woke on one occasion and there were two black men in my flat who I didn’t know. Magistrates enforced the closure order, with no one allowed to enter the premises apart from Crozier for 49 days.